This article will tell you about how to download and install ClubWPT software. You are in one step before you can join other players and start competing for cash prizes. ClubWPT holds great tournaments but first of all you need to create a new account and run poker software. It looks like you are looking for a download link? Stop right now, because ClubWPT doesn’t require any installation. A new player must create a new account and run the poker client in web browser. It’s a surprise for many players. Most of people who want to start their poker adventures at WPT Club are looking for a poker client to install. That’s a normal practice for most of the poker rooms. But not for WPT Club. If you want to play there you will have to use your web browser for this. On the one hand that’s not good. Though independent program requires downloading and installation, it has flexibility in terms of playing multiple tables. It’s much easier to play 6-8 tables if you have independent poker client. But if you play from web browser, multitabling is a little bit difficult. You have to open new tables in your poker lobby and switch between them like you do it in web browser. There are other minor restrictions but in general this option is rather good and has advantages. The best and most valuable advantage is mobility: you can play your favorite poker games from any computer with browser. If you compare this option with standard poker room you will see that standard poker rooms require player to install special soft to all computers where you want to play. But ClubWPT soft / client is much easier to use. If you have free time at work you can just launch ClubWPT website and start playing. Anyway, there is only one way to join the Club – you need to create a new account and launch the client in browser. No downloading is required. Now let us tell more details about how to create new account and start poker games. Get 2 weeks of Free Trial NOW! First of all click the link above to create a new account. You will see ClubWPT website with a big promo banner. There are two buttons: New User and returning User. You need to click New User and special registration form will appear. Fill this form with your data. There is “Bonus Code” field. You can leave it blank. 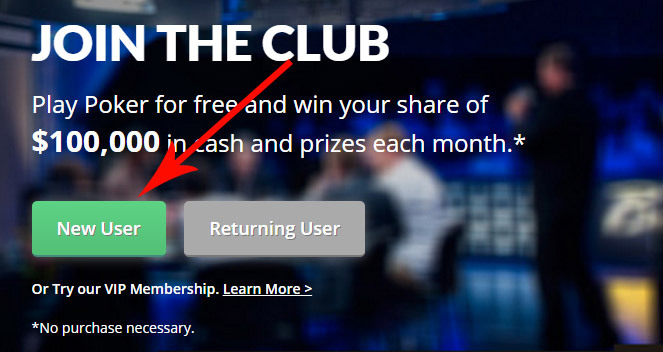 ClubWPT doesn’t offer any deposit bonuses because there are no deposits there. If you leave this field blank you don’t lose anything. So don’t worry and move forward. You will not be asked to enter your payment details at this step. Everything is free. After you click “Create my Free account” button, you will receive confirmation e-mail. After you confirm registration your account will become active. Now you can log-in. Congratulations! You are member of ClubWPT, you have account with Basic permissions which allows you to access poker lobby and participate in play money games. But where is the download link you may ask? Forget about it. You don’t need to download WPT Club client because you can play from browser. You need to log-in at the website, launch lobby and play. Don’t search for a program download button. You will not succeed. There is no traditional poker client. You have to play from browser. That’s how the poker room operates. They really had separate client several years ago. Players had to install it and use it for playing. It is a traditional practice of poker websites. But they decided to get rid of the client and create a web interface for players. Right now you can access ClubWPT from web interface only. All new players receive “Basic” membership status. You can’t compete for real money prizes as a basic member. If you want to participate in tourneys with real money prizes you should upgrade your account to “VIP”. This can be done by purchasing monthly subscription. Note, you get access to tourneys with real money prizes after you buy subscription. You don’t need to make deposits! All you need is to pay small monthly fee. And that’s all! It’s a perfect deal! Once again: there are no cash deposits at ClubWPT. You just pay monthly subscription and play in great tourneys with cash prizes. That’s why ClubWPT is 100% legal in United States. All US poker players should try this amazing poker room. All your winnings can be easily withdrawn. If you still doubt about creating account, we offer you one more reason to join the Club. If you create your account now you will get 2 Weeks Free Trial period. During this period your Basic account receives temporary upgrade to VIP for free. You will have 2 weeks of free VIP membership and all winnings you get during this period are yours! It’s a perfect offer! You don’t pay anything and receive a chance to try all ClubWPT services and offers. You will be able to participate in all tourneys and promotions. Is there a reason to miss such offer? Don’t waste time and claim your Free Trial now before the offer expiries! Many of the players often ask about ClubWPT app for android or IOS. They are looking for a place where app download link can be found. It’s not a surprise. Smartphones and tablets become our constant “companions”. Many people use smartphones much more than computers. But unfortunately ClubWPT ignores this tendency. There is no special Android or Apple App, and that’s sad. Such application might bring a lot of new players and make the room full of poker fans. But anyway you can run Club client from smartphone, Iphone or Ipad. Don’t forget that each smartphone has web browser and that’s why you can still play poker from smartphones if you want. Of course an app is always much easier to use, but right now there is no ClubWPT application available. So there are two options: not to play from smartphones and tablets or to use web browser. Maybe they will add application later but to be honest there is no any information or rumors about this. On our opinion adding an app would be a solid move, but unfortunately WPT Poker Club doesn’t think so. We will most likely have to wait until smartphones get bigger share in internet traffic. They might start building an app when they see that their site is visited from smartphones and tablets. It looks like right now the share of mobile devices is low and they don’t want to waste money building an app.